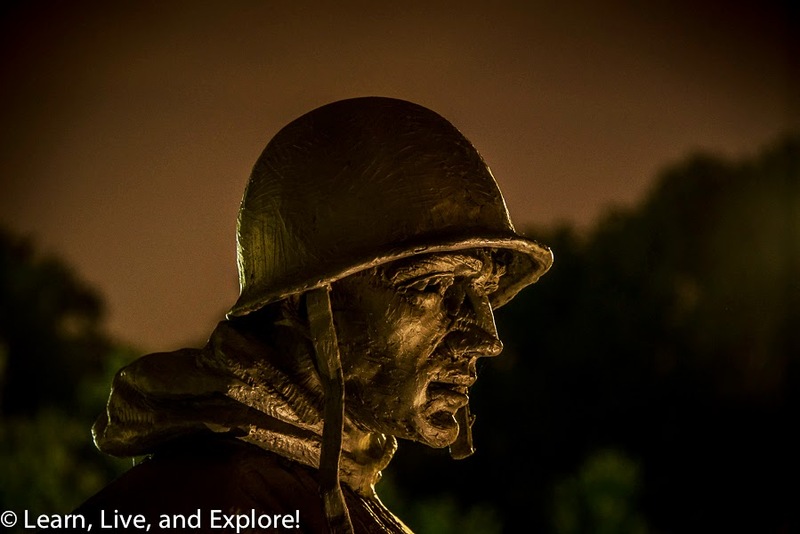 D.C. Monuments at Night - Part 2 ~ Learn, Live, and Explore! 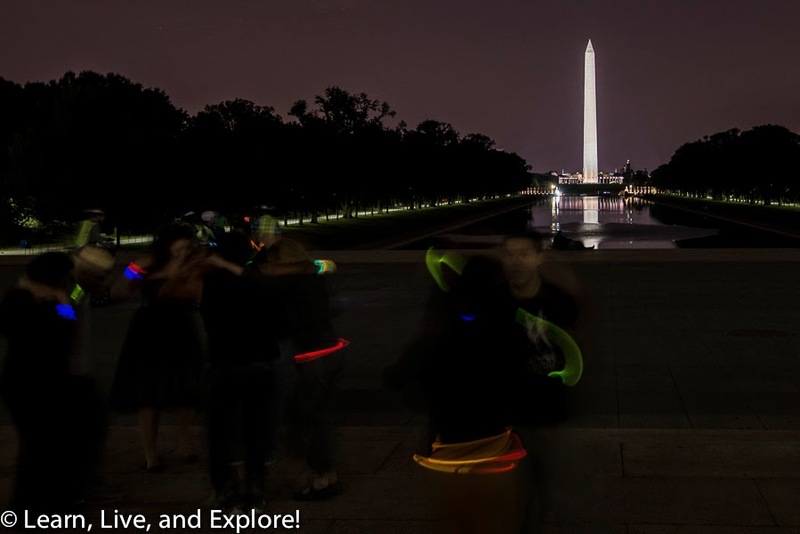 This past weekend, I had family visiting Washington D.C. which gave me the perfect excuse to head out for a nighttime photography excursion! Plus, I've only posted one other time on D.C. night photos, and that was over a year ago, so it was about time for another - especially since I'd like to believe that my photography skills have improved, even just a little bit, since then. 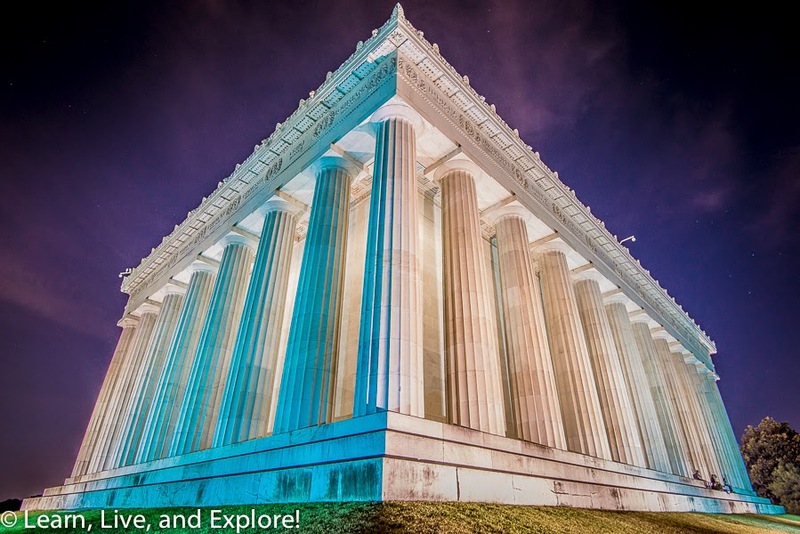 We only caught the tail end of the sunset, but still captured a good amount drama to backdrop some wide angle shots of the Lincoln Memorial. 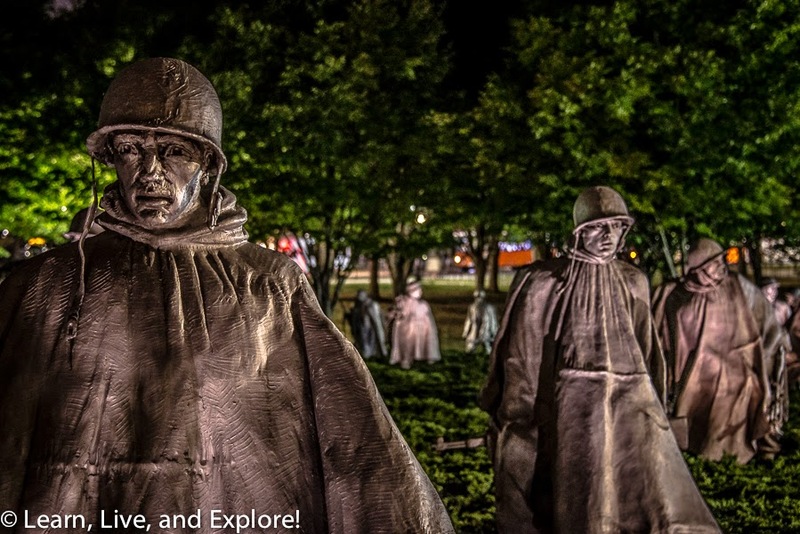 While there are tons of destinations along the National Mall for quintessential D.C. night shots, we took our time focusing only on the west end - Lincoln, the Reflecting Pool, and the Korean War Memorial. 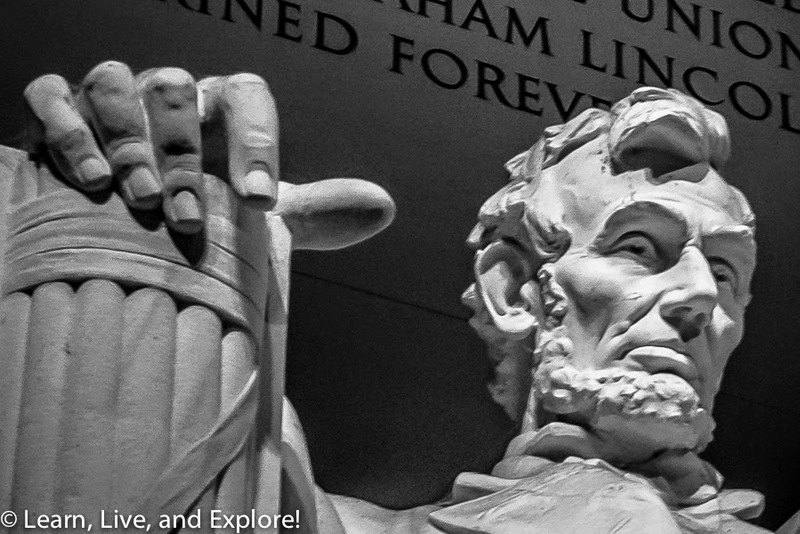 I find that it's important to really play with the Lincoln Monument because there are so many angles, textures, and framing opportunities. Of course, you will need your tripod and wired remote for all of these! 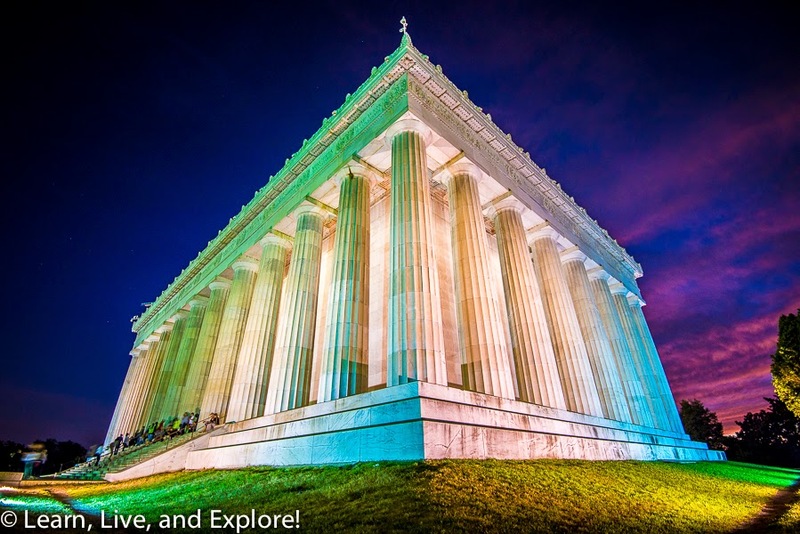 I've really been getting more into HDR - or high dynamic range - photography effects, so you can see some of that in the Lincoln exterior shots. 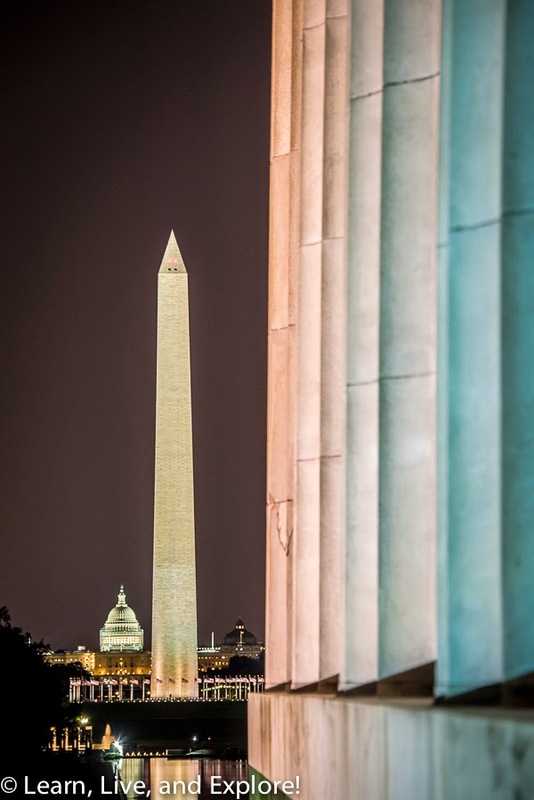 I also took advantage of the shadows and the thin clouds and bumped up the saturation of the subtle colors being projected on the monument by monument floodlights. Processing photos, while tedious, can also be a fantastic experience because sometimes you never know what you end up capturing with longer exposures. 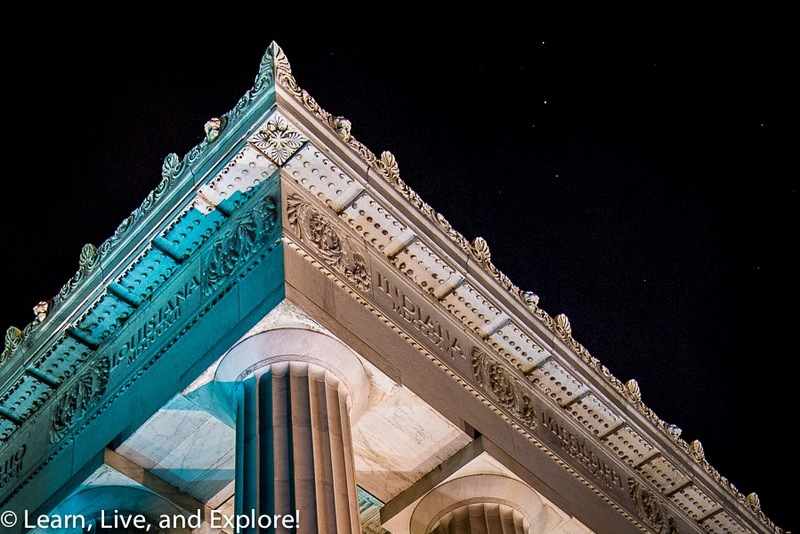 And in this case, I was pleasantly surprised to get some stars hanging out above the detailed top of the Lincoln Memorial. 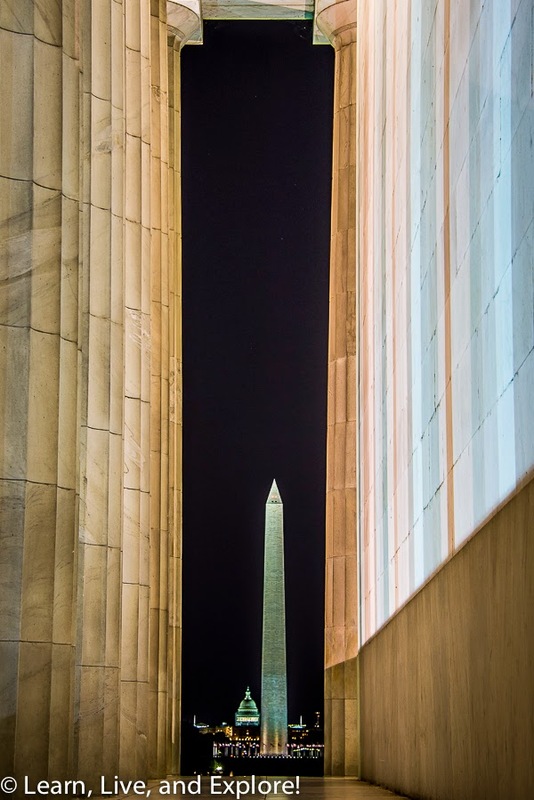 The columns bordering the monument provide some great opportunities for leading line compositions and for framing up the other major stars of the mall - the U.S. Capitol and the Washington Monument. 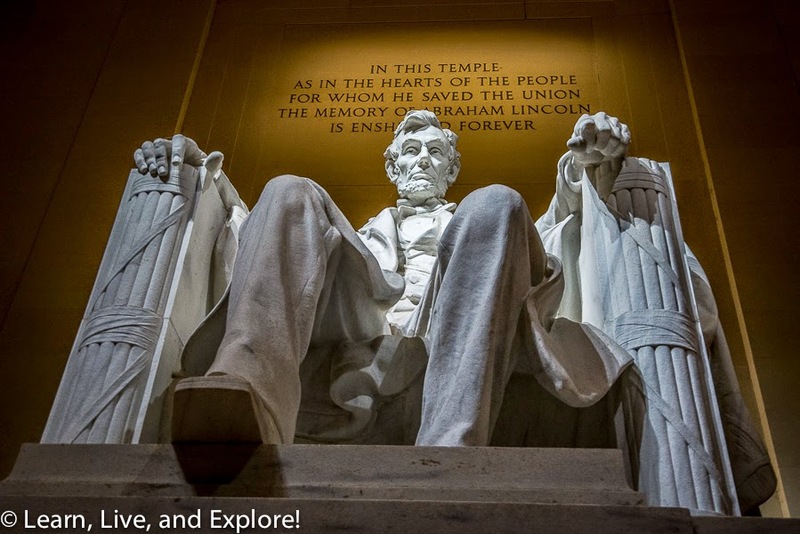 Of course, it's a requirement that you shoot Lincoln, himself, though note tripods are not allowed inside the monument for safety reasons. I found that an open aperture and a good wide angle lens gave me enough flexibility with the lower light conditions. Just down the steps, en route to the Reflecting Pool, we came upon a salsa social dancing group performing for fun. When I saw that they were wearing glowsticks as bracelets, necklaces, and belts, I wondered how to capture that beautiful moment. 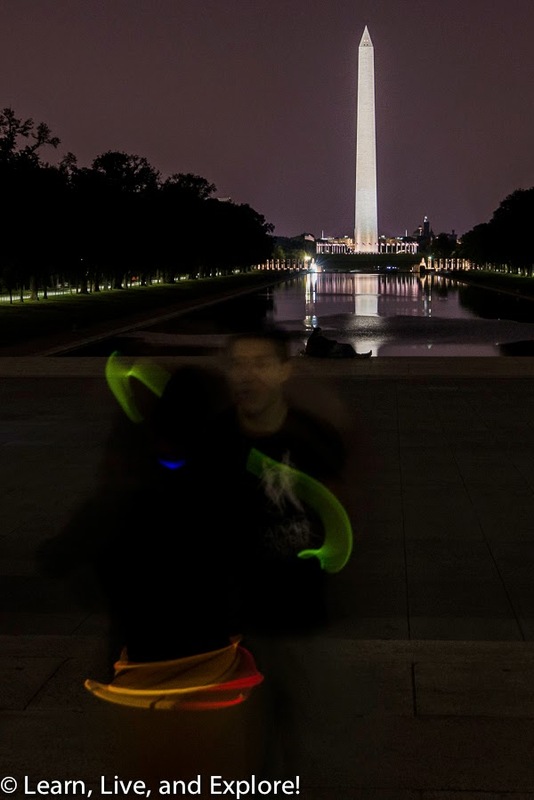 I opted for an approximately 1 second exposure, which complemented the movement of the dancing, as portrayed by the moving colorful lines from the glowsticks. 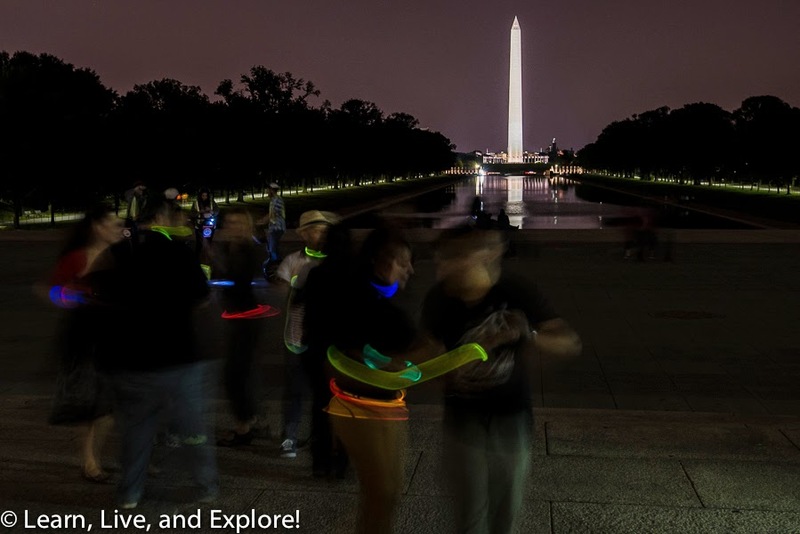 And, of course, the gorgeous background of the Reflecting Pool just grounded the scene and said "This is D.C." I honestly don't mind that the people are blurry because that was the moment and it invites you to preview my memory. This next shot is a reorientation and crop of the previous image that isolates a couple and makes it more personal. Finally, we wandered to the southside of the National Mall's west end to see the Korean War Memorial because I had explained to my cousin that this was my least favorite of the Mall installations. 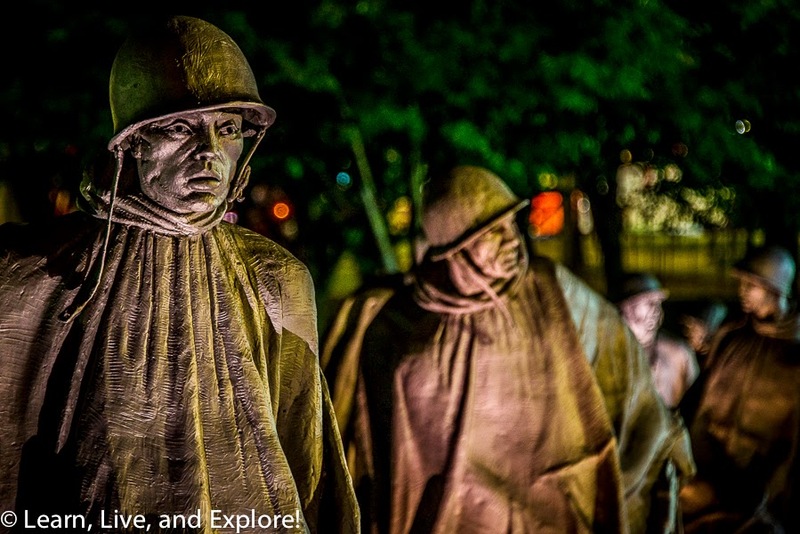 With no disrespect intended to Korean War Veterans or their descendents, or to U.S. Veterans in general, this is the scariest "tribute" I've ever seen, especially at night. The men of all branches of service are depicted as if on winter patrol in Korea, wearing their heavy weather gear. I think it's the way the sculptor did the eyes that gives me the creeps because they seem very hallowed out and almost zombie-like. Anyway, I invite you to visit for yourself, in the day or at night, to see what you think. Good post. Thanks for sharing this post with us. shapes and are available with different styles like beaded, in silver and gold styles. If a series has beads thereon or it created out of silver and gold and added with a novel stone, whale tail bracelet indeed, the bracelet can look elegant and exceptional.